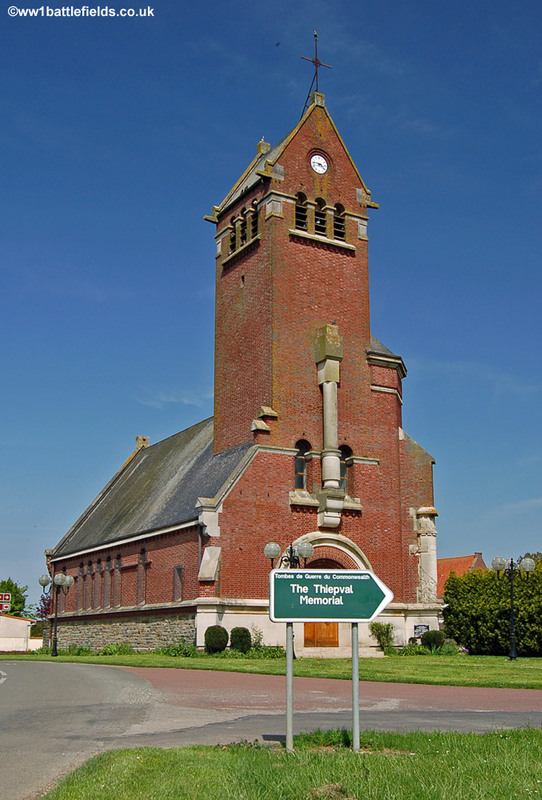 Thiepval was one of the fortress villages that was held by the Germans on the Somme front in 1916. Thiepval village was destroyed by the bombardment, except for one part of the chateau (the ruins of which contained machine gun nests). The houses in the village, although flattened, had deep cellars where the Germans held out, and their machine gun posts were not destroyed by the bombardment. On the 1st of July 1916, in front of and to the south of the village, the 32nd Division attacked (see Leipzig Redoubt below). The 36th Division attacked just to the north of the village. 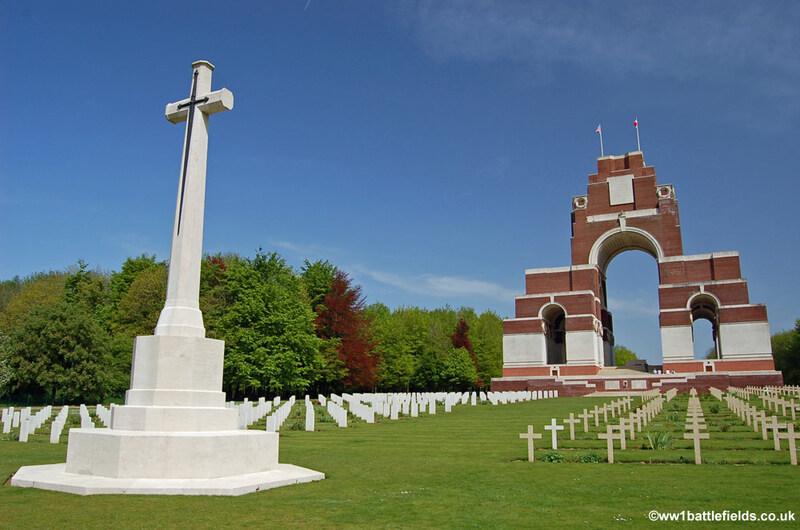 After the War ended, Thiepval was chosen as the location for the Memorial to the Missing to commemorate those who died in the Somme before the 20th of March 1918 and have no known grave. This is the largest and most imposing of the Memorials to the Missing, and visiting here is a moving and sobering experience. Those who died in the Somme after 20th March 1918 are commemorated at Pozieres. The Visitors Centre at Thiepval was opened in September 2004. There is a large car park next to the Visitors Centre, and inside, as well as a shop and interesting displays, are toilets and vending machines for hot and cold drinks. 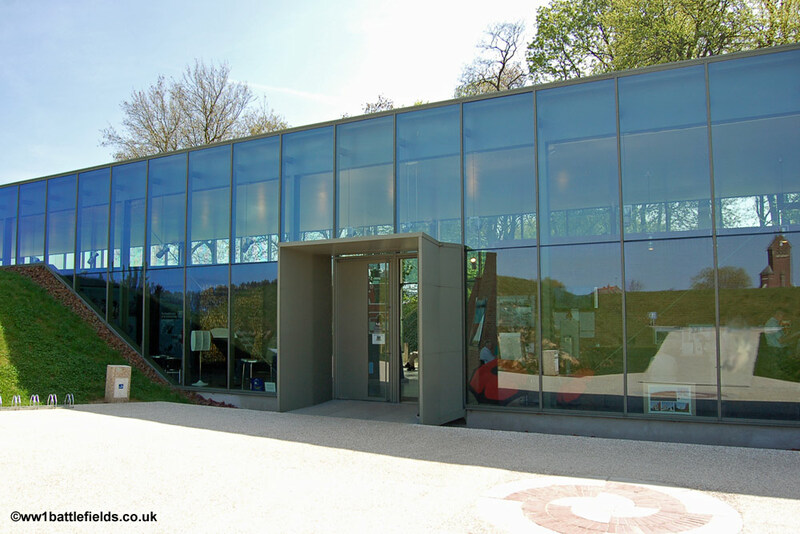 The Visitors Centre is a modern, glass fronted structure, and a foundation stone in the wall to the right of the entrance was laid on Monday the 27th of October, 2003. Inside the entrance is an information desk, with displays and a model of the memorial to the left. 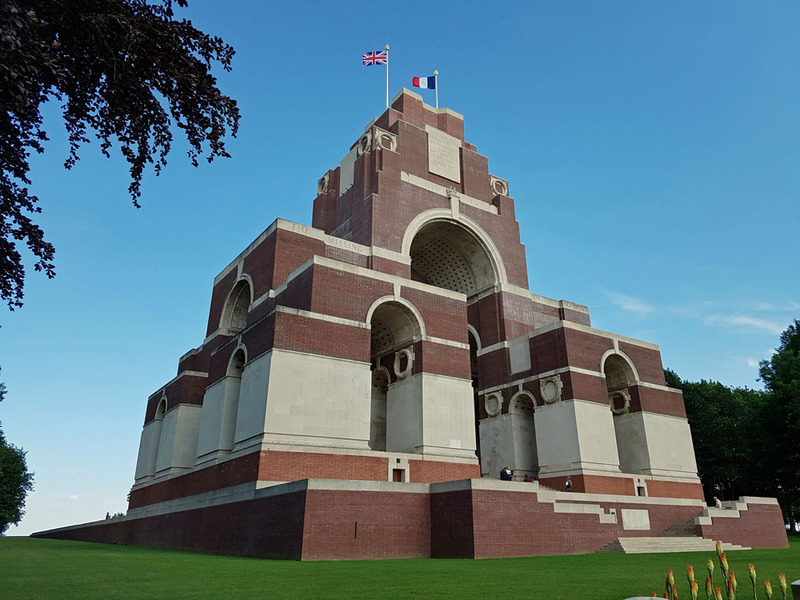 The left hand portion of the Centre contains the displays which cover the war, Thiepval and the missing who are commemorated on memorial. There is also an audio-visual presentation, and two photographic panoramas which were taken by the Fourth Army. These long photographs show the whole landscape with features marked, including the British and German front lines. The modern equivalent panoramas are shown beneath the wartime ones, with the Thiepval Memorial and other sites clearly visible. Doors on the opposite side of the Visitors Centre from the car park lead to the Memorial itself. 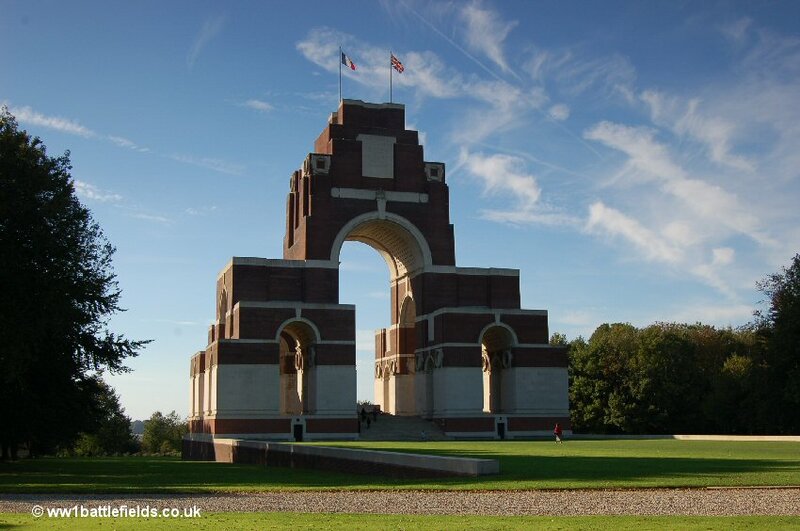 The Thiepval Memorial is the largest of the Memorials to the Missing, and the last on the Western Front to be unveiled. 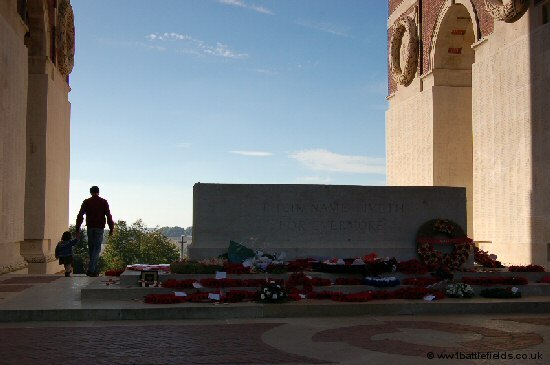 Negotiations to purchase the site started in the late 1920s, and the memorial was unveiled by the Prince of Wales (then also President of the Imperial War Graves Commission) on Monday the 1st of August, 1932. The Prince’s speech, partly in French, was carried on radio broadcasts, and he called the memorial “the crowning stone” of the work of the War Graves Commission. He added that “our first thoughts today should be with the relatives of those whose death has purchased our current freedom”. Speaking just seven years before the clouds of World War were to descend once more, he hoped that this was the opening chapter in a “Book of Life” from which the horrors of war would be banished, and that it would be a call to a better civilization. At the end of the Ceremony, the Last Post was played. On the 1st of July 2016, the 100th Anniversary of the Battle of the Somme was remembered here. The ceremony was attended by the British Prime Minister, David Cameron, French president Francois Hollande, the Prince of Wales, the Duchess of Cornwall, the Duke and Duchess of Cambridge and Prince Harry. Several thousand people attended the event. The Memorial is a massive arched structure, with large laurel wreaths carved on top of the pillars and towards the top of the memorial. At the time of the unveiling in 1932 there were 73,357 names commemorated here. Today there are 72,395 – the slight decrease represents the identification of bodies since then, resulting in soldiers no longer being ‘missing’. Some additional names have also been added and are listed on panels on the side near the cemetery. 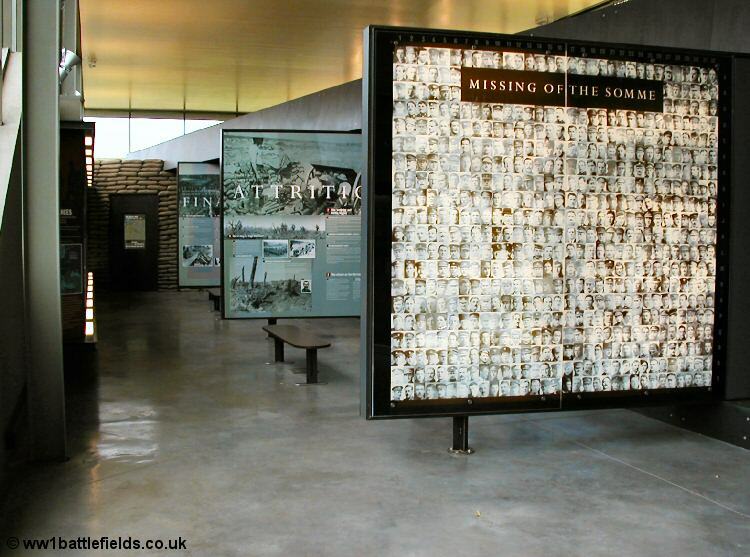 On the panels of the arches are the names of those died but who have no known grave – ‘the Missing’. However, many of these soldiers may be buried in the Somme, but in a grave marked as ‘Known Unto God’. The panels on the memorial are arranged by Regiment, then within each Regiment by Rank and within that alphabetically. To locate a particular name, the CWGC website is the best resource. The Memorial covers the missing of Britain and South Africa. The Missing of other nations have their own memorials; for example Canadians at Vimy Ridge and the Newfoundlanders at Beaumont Hamel. With so many names, there are VC winners, poets, writers, politicians and of course maybe your own ancestors who died in World War One. One is the name of H. H. Munro, better known as ‘Saki’ the short story writer. He was killed on the 14th of November 1916, aged 45, and his name, with those of other Royal Fusiliers, is on Panel 16A. Behind the Memorial is a joint British-French Cemetery, intended to symbolise the losses both countries suffered. The idea of a joint memorial had been suggested as early as 1923, and early plans included side chapels where the names of the dead would be inscribed. Another early plan was for a charge of £5 for a name to be engraved in bronze on the memorial wall. Luckily this did not go ahead as £5 (more than £200 in today’s money) would have meant only the elite and rich would have had their names engraved in bronze. As it is, all names are equal here, although they are listed by rank on the panels. 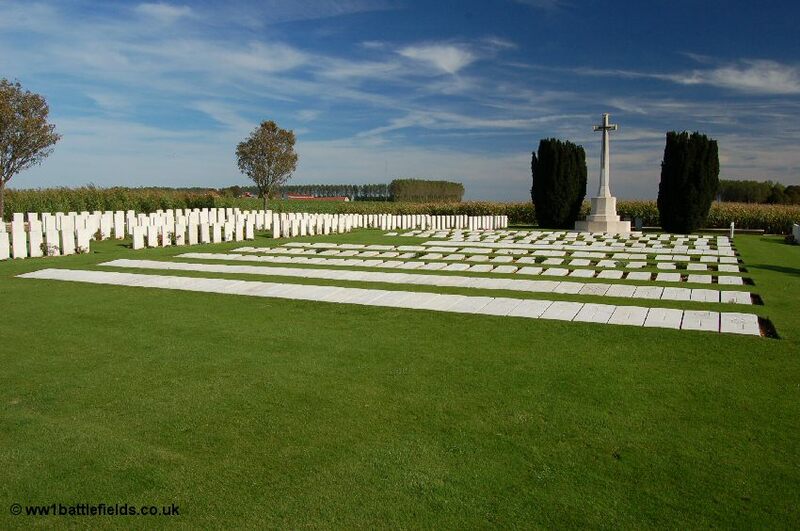 The cemetery here at Thiepval was made after the Memorial itself had been constructed. There are matching numbers: 300 Commonwealth burials and 300 French burials. 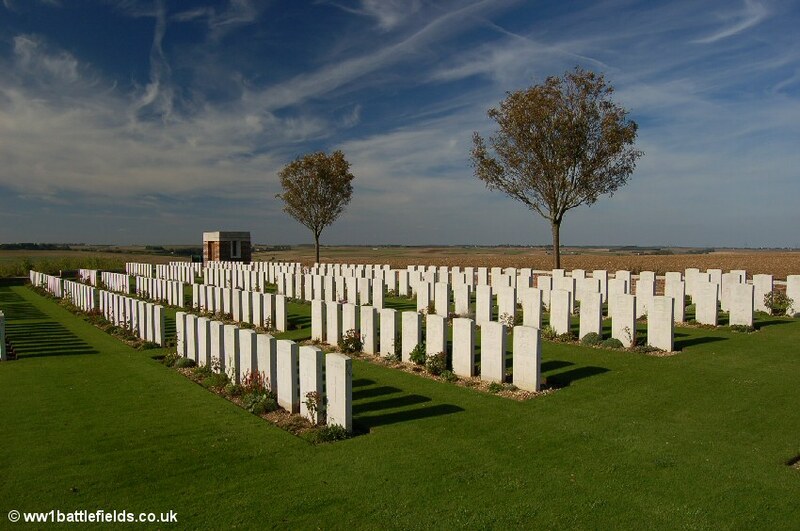 Many of the Commonwealth graves are those of bodies recovered from the 1916 battlefields on the Somme, but also soldiers were reburied here whose bodies had been recovered from as far away as Loos and Le Quesnel. 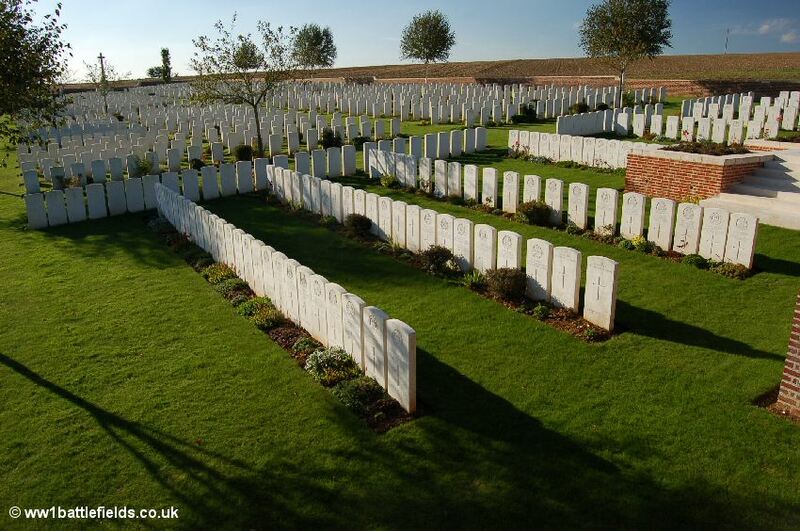 Only 61 of the 300 British and Commonwealth soldiers buried here are identified, and only 47 of the French soldiers. At the base of the Cross of Sacrifice are the words “That the world may remember the common sacrifice of two and a half million dead, here have been laid side by side soldiers of France and of the British Empire in eternal comradeship“. If you return to the main entrance to the Thiepval Memorial, and look down the road to the left (as you exit the Memorial grounds) an obelisk memorial can be seen. This is a memorial to the 18th Division. The 18th Division fought here on the 26th of September 1916, when most of the village was taken. The 12th Middlesex advanced through the village itself with further advances made later. The attackers left their trenches and crept forward into No Man’s Land before the British artillery barrage lifted, meaning that they had less distance to cover to reach the German front line. It also meant that the German counter-barrage fell on unoccupied British front line trenches – the troops were ahead of it in No Man’s Land. 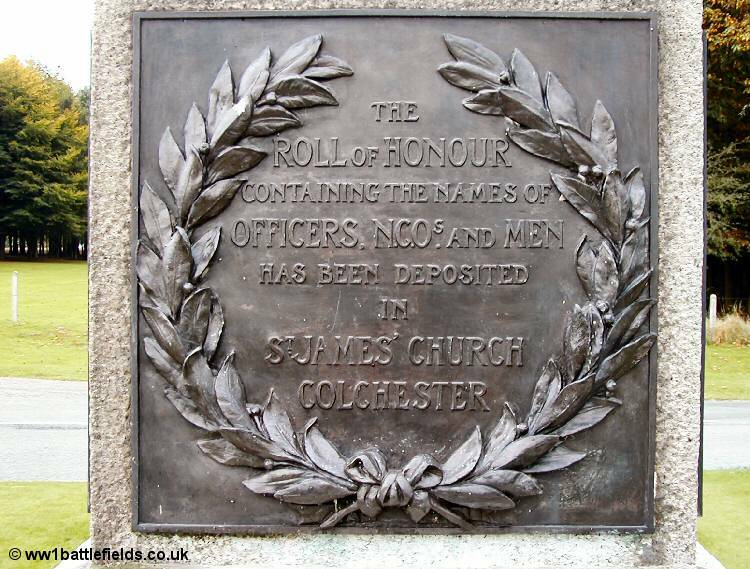 On the front of the Memorial are the words “To the Glory of God and in imperishable memory of the officers, NCOs and men of the 18th Division who fell in the Great War 1914-1918“. On the left side are listed the Division’s battle honours 1916-18, whilst on the right are listed the units which made up the Division. 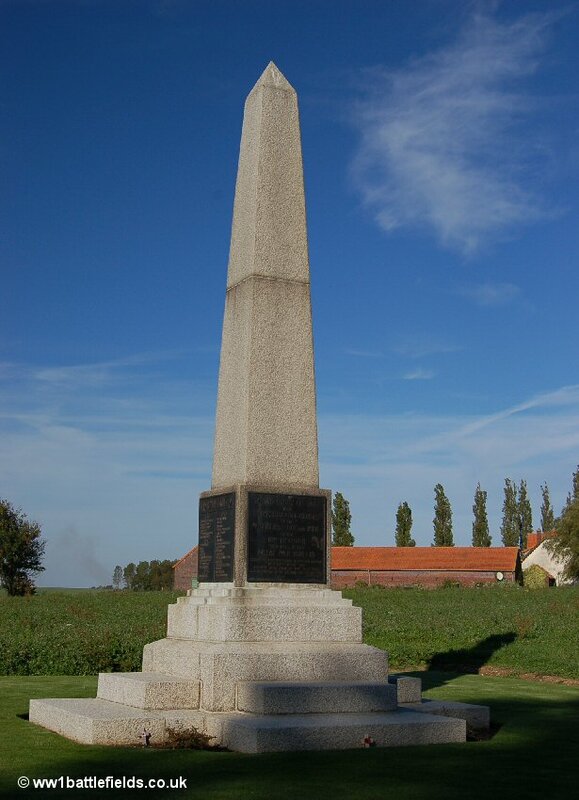 There is another memorial to the 18th Division not far away at Trones Wood, which is different in appearance, and a third which is identical to this one near Gheluvelt in the Ypres Salient. As you enter the Thiepval Memorial site from the Visitors Centre, with the Memorial itself to your right, a grass path leads straight ahead across the fields in a south-easterly direction. This path crosses the site of German support trenches, and leads to the site of the Leipzig Redoubt, a German stronghold in this sector. From the path on the ridge there are excellent views; looking left one can see the radio mast at Pozieres on its ridge. To the right are the positions from which the 16/Northumberland Fusiliers advanced on the 1st of July, 1916 – preceded by a football they kicked ahead. 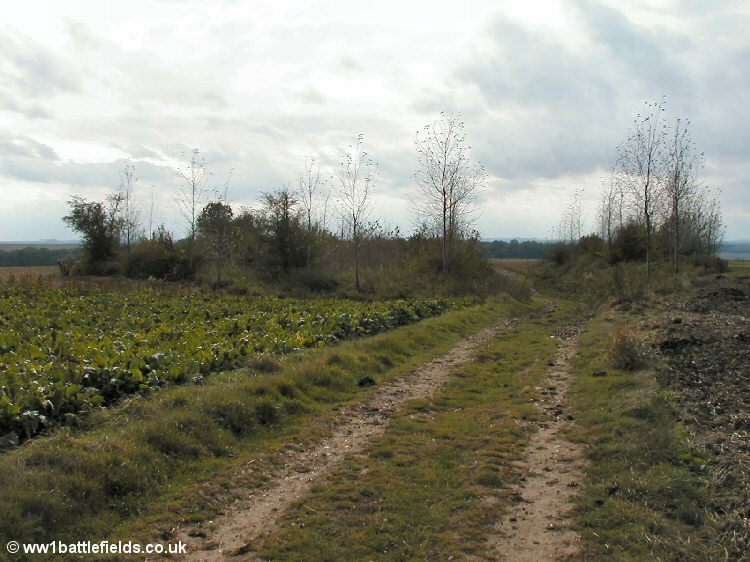 A clump of trees and bushes just as the track starts to drop downhill marks the location of a quarry which lay at the centre of the Leipzig Redoubt. The Redoubt was a huge strongpoint with numerous machine guns, which completely commanded No Man’s Land to its south and west. The 32nd Division attacked here on July the 1st 1916. No Man’s Land here was narrower here than to the north and the south, and men of the 17/Highland Light Infantry crept forward at 7.23 a.m., even before the British barrage had ended. They advanced to within about 40 yards of the German front line, and when the barrage did lift, at 7.30 a.m. the Highlanders rushed forwards. They took the Leipzig Redoubt, catching the Germans in their dugouts in the quarry at the centre of the Redoubt. They then pressed on to the next objective, but were forced back to the Leipzig Redoubt, where they consolidated with help from troops of the 2/Kings Own Yorkshire Light Infantry. Later they were joined there by men from the 11/Border Regiment and from the 1/Dorsets, but further advance from the Leipzig Redoubt proved impossible. The small advances made here, in taking the Redoubt, were the only success for the 32nd Division that day. The position was strengthened and held against several German counter-attacks. Whilst there is little to see within the site today, the remains of ordinance can be often be seen in the fields around, testament to the fierce fighting here. This can include grenades as well as .303 rounds. If you do see items such as shells or grenades, remember that picking up live ordinance can be dangerous, and sometimes even fatal. From the Leipzig Redoubt you can return to the Thiepval Memorial, or the track leads on down to the road between Authuille and Ovillers. Turning left at the road takes you to Lonsdale Cemetery. Lonsdale Cemetery is just a short distance from the Leipzig Redoubt, and is set away from the road, reached by a path down in a valley. The name comes from the 11th Borderers, sometimes known as the Lonsdales (from Lord Lonsdale who was involved in the recruiting of this battalion). They fought here on the 1st of July 1916. 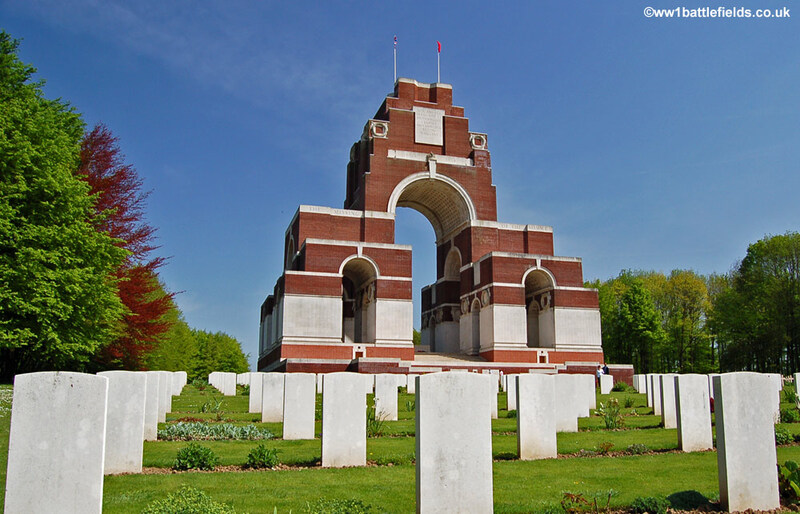 From the cemetery, you can look up to the Thiepval Memorial on the skyline. The wooded area that is the site of the Leipzig redoubt can also be clearly seen, just a short way up the track that leads back to the Thiepval Memorial from the road. Lonsdale Cemetery was one of two cemeteries made near here with that name; Plot One here was originally ‘Lonsdale Cemetery No. 1’, and the graves from ‘Lonsdale Cemetery No. 2’ were moved here after the Armistice. Plot 1 includes a row of graves of men from the Border Regiment who died on July the 1st, 1916. Steps at the front left of the cemetery lead up to the entrance. The original graves which comprise most of Plot 1 are at the front left. Row D is of men who died on the 1st of July 1916, mainly from the Border Regiment. The setting and location are extremely tranquil today, but in 1916 this spot was just within the British lines, near a location known as ‘The Nab’. Several of the trenches that ran near or at the location of the cemetery had associations with Liverpool – for example Aintree Street, Liverpool Avenue and Mersey Street. 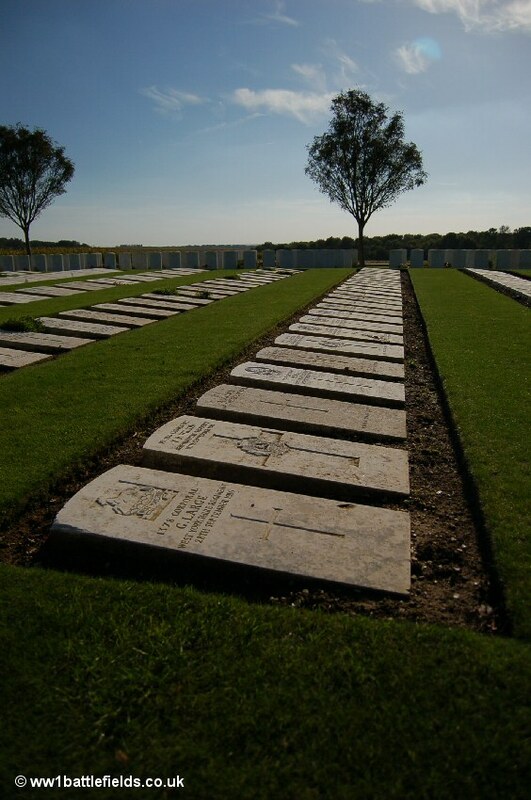 There are now just over 1,500 buried here, as the original 96 graves were added to by concentration of graves from smaller cemeteries and bodies recovered from the battlefields after the Armistice. There is one French grave, in Plot 3 row O. 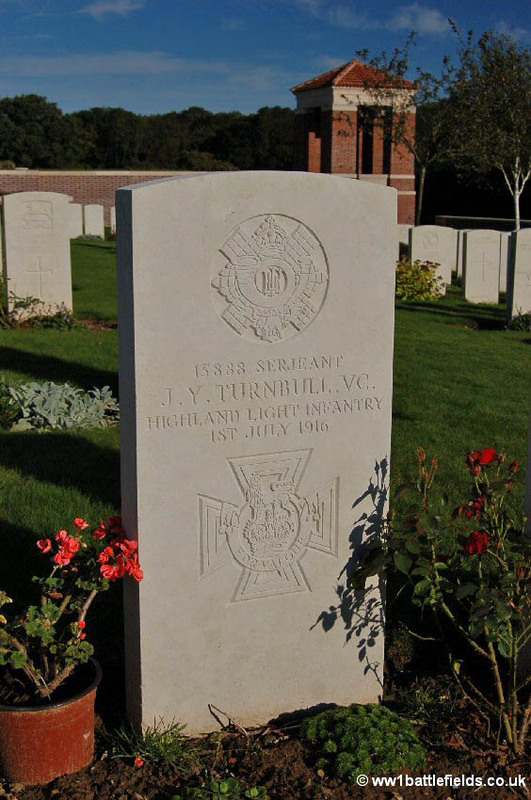 A 1st of July 1916 Victoria Cross winner is buried here: Serjeant James Yuill Turbull, of the 17th Highland Light Infantry. His VC was won at the nearby Leipzig Salient, where having captured their position, he and his men were attacked time and time again by the Germans who were determined to drive them out. He lost several parties of men sent to reinforce him, but ‘almost single-handed, he maintained his position and displayed the highest degree of valour and skill in the performance of his duties‘. 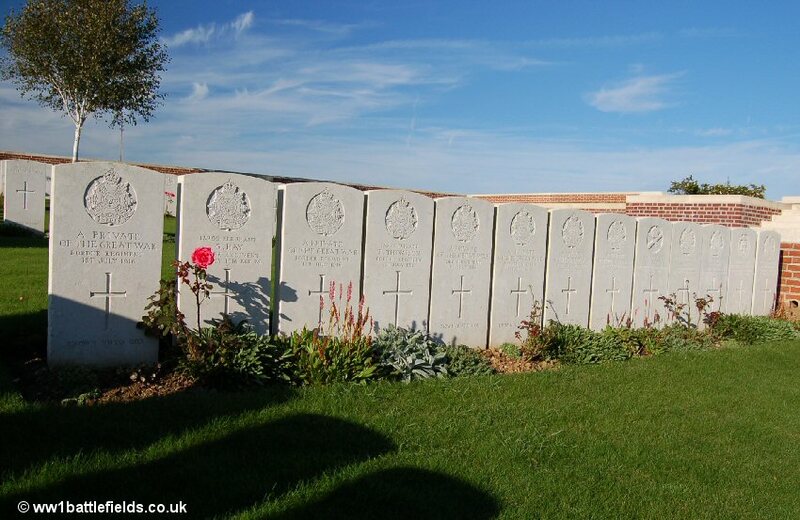 Also buried in Lonsdale Cemetery is a 16 year old boy, Private Thomas Moore, who died in August 1916. 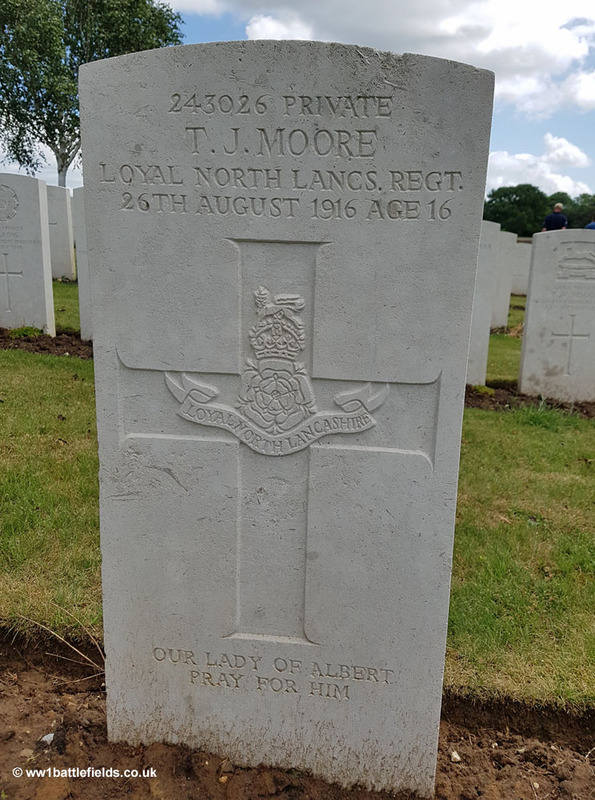 I visited his grave recently at a time when my own son was 16 – it is horrifying today to think of boys as young as these fighting in the war. Mill Road Cemetery was started in the spring of 1917, when burials were made here of soldiers recovered from the 1916 battlefields. After the Armistice, more than a thousand other burials were moved here, from the battlefields, and from other smaller cemeteries. This was part of the process of concentrating battlefield graves into fewer cemeteries as the land was reclaimed and reused. It now contains 1,304 burials, with 62% being of unidentified men. The identified burials are mainly of soldiers who died in 1916, but there are some from 1917 and 1918. The name of the cemetery comes from the road from where the Ulster Tower now stands down towards the valley of the Ancre. Because the cemtery was positioned over a network of old German trenches and dugouts, the headstones in the original part are laid flat. The later plots of graves which were moved here later do have upright headstones as normal.